Give the gift of membership! Surely someone on your list would love a gym or book club membership, tickets to a football game, the theatre or ballet. Do you know anyone who might like free babysitting or a car wash? These gifts require essentially no wrapping or driving (ie: no fossil fuel emissions) and will be sure to impress the giftee with your thoughtfulness. For a more environmentally aware giftee, try a donation in their name to the Sierra Club or another environmental justice group. Get creative with wrapping! Re-use newspaper, tins or boxes, sheet music, magazine ads, scarves, brown paper bags or comics as wrapping. Try replacing packing peanuts with popcorn for a creative twist. This is a great family activity as well as being financially and environmentally friendly. Send an E-card! Instead of sending mounds of cards and envelopes and spending a small fortune on postage stamps, send an E-card. They can be playfully personalized in so many ways. Those who receive this E-card will be proud of your eco-conscious ways. For a more personal and touching way to send holiday greetings, use an old fashioned method – the telephone! Get busy with crafting! Everyone loves a handmade gift, and most people would even prefer one to a store bought gift. This is an especially good idea for those on your list who are harder to buy for. Search the internet for ideas on handmade Christmas ornaments, baked goodies and many other ideas. and growing your local community and reducing emissions be cutting your commute shorter. Buy green! Try a reusable water bottle, organic clothing, or make a gift basket of your favorite organic items like chocolate, all natural soaps or lotions, and teas or coffee. Don’t buy a plastic tree! Don’t buy trees made from environmentally harmful plastics, there are other environmentally friendly ways to make the season bright. Buy from a local tree farm which sustains local business, cuts down on emissions, and you can feel good knowing that another tree will be planted in its place the next season. Another option is to buy a potted plant/tree, decorate it for the holiday, and then plant it outside when you’re done. Use LED lights! While they may cost a little more initially, they are a great investment. They can use up to 90% less energy than conventional lights and stay lit longer. It’s easy to get caught up in competing for the ‘best lit’ house, but remember – less is more! Get crafty or buy second hand! If you are feeling crafty, use the internet to find a plethora of articles and videos that show you how to make handmade Christmas decorations. If you’re not into crafts, check out your local consignment or second hand shops – you’d be surprised what decorating treasures you may find! Recycle old electronics! If you get a new cell phone, TV, computer or other electronic device, make sure you recycle the old one properly. Recycle your tree! Many areas have a tree recycling program after the holidays. Re-gift, give or sell! After the holidays, many of us find ourselves trying to make room for our new goodies. Find a Goodwill, Salvation Army, a needy neighbor or a consignment shop to take your old clothes, toys and furniture. Some places will even pay you small amounts for your old things – who can argue with making an honest, good for the environment dollar at Christmas? Jamie Quinn is a mother, wife, graduate student of Environmental Science, and the owner of Elk River Naturals – providing all natural and organic home, health and body products (http://www.etsy.com/shop/ElkRiverNaturals. She can be reached at elkrivernaturals@gmail.com. Jamie is giving away a great winter gift set! Enter both ways for two chances to win! Likes and comments will be numbered and a winner will be picked at random. Contest closes Sunday at 5pm Pacific Time and will be announced later that night! Contest open to those who live in the US. Such great ideas! I’m totally into giving homemade gifts this year! I also found directions for making bows with old magazines…so much fun! Nice to see my article on your blog, Lindsay! Thanks for having me! AWESOME ideas!! I love making gifts to give to others and seeing their faces when they realize that it was hand made. I’m constantly looking around all year for ideas for different crafts. Just made 9 — 5 inch wreaths today with maroon and white ribbons out of old garland. Total cost was under $4.00!!! Love thrift stores too!! Have an awesome Christmas!! Loved your article! Great ideas- I love homemade gifts! Great giveaway for this time of year! Lots of colds in my house are delaying the last two purses I need to sew. Thanks for reminding me of disposing some of our things by recycling. the cold & flu vapor balm sounds like a great idea! Its the time of year! 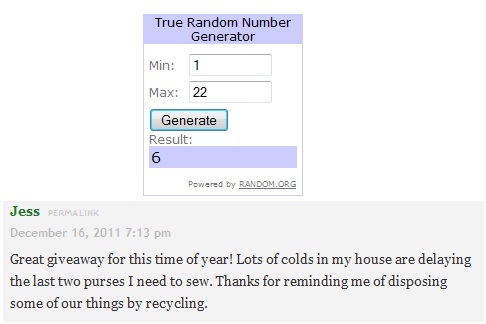 to get crafty! 🙂 thanks for the ideas! Great article and ideas!! Thanks Jamie! !